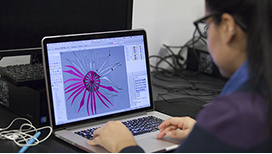 Cooper Union’s courses in Digital Fabrication offer artists, engineers, architects, designers, and makers of every type the chance to add skills in digital interfaces and two- and three-dimensional fabrication, a growing requirement in today’s competitive professional and creative environment. Participants gain hands-on experience with 3-D printers, CNC milling machines and laser and plasma cutters.. This class is a hands-on introduction to 3D modeling that aims to familiarize students with the principal types of 3D modeling software available on the market today and through practice-based learning, develop fundamental skills in 3D modeling. This course prepares students to create quality visualizations from 3D modeling and photography, while learning the basics of modeling in Rhinoceros and several techniques of representation.